The average consumer is searching for homes on four to six different websites at a time. You are dealing with a lot of competition from different agents and different listings. How can you set your team of agents apart from the rest of the competition? As the capabilities of automation grow and evolve to help us accomplish more and more mundane tasks in our daily lives, it can be easy to get swept away by the possibilities. It might seem quicker and more efficient to automate an email send to a new lead that comes through. However, it's important to encourage your team to take a step back and reflect on their methods. Guide them to focus and capitalize as much as possible on the service mindset. The service mindset will allow your agents to connect and build rapport with more real estate leads at a faster rate. Those connections will lead to more homes sold. Seventy percent of home buyers work with the first agent they have a conversation with. Make sure you are the first agent to connect by reaching out as soon as possible— speed to lead. Ignore the desire to send an automated email and pick up the phone. Engaging with your real estate leads as a real person — connected to a real voice — instantly separates you from the rest of the agents who chose to communicate via automated email. Ask how you can help your leads sharpen their searches. Focusing on how, exactly, you can help them will start the process of building a rapport based on trust. Your lead is making one of the biggest investments of their lives. They need to trust you to be the best option for them. That won't happen if they can't connect with you. Speed to lead and make the call. As you continue to nurture your real estate leads with regular contact you will be able to start automating the emails you send out each week or month. When determining what content to include in each email remember to capitalize on the service mindset. Put yourself in your lead's shoes. Consider where they are in the buying process as you decide what content will be most useful and serve them best. Not every email needs to be — or should be — about current listings. Diversify your strategy while still focusing on the service mindset. Send your leads content that's off the beaten path, but still pertains to them. If they are moving to Rhode Island, consider sending them information they might like to know about the area — maybe a ranking of the top ten seafood restaurants in the state, or a listing of respected home inspectors in the area. Switch it up each time you connect. However, make sure that everything you send to your leads benefits them in a clear way. They will be grateful for the unexpected help and impressed by your desire to do what's right for them. The truth is, most agents don't do these things. The average agent sells four or five homes a year. If you want to leave those numbers in the dust and have your agents selling more and more homes, then you need to adopt the service mindset and instill it in your overarching strategy. That's how your team will convert more leads and sell more homes. Agents who connect with each real estate lead and provide excellent service to them as they search for a new home will close more deals, more often. 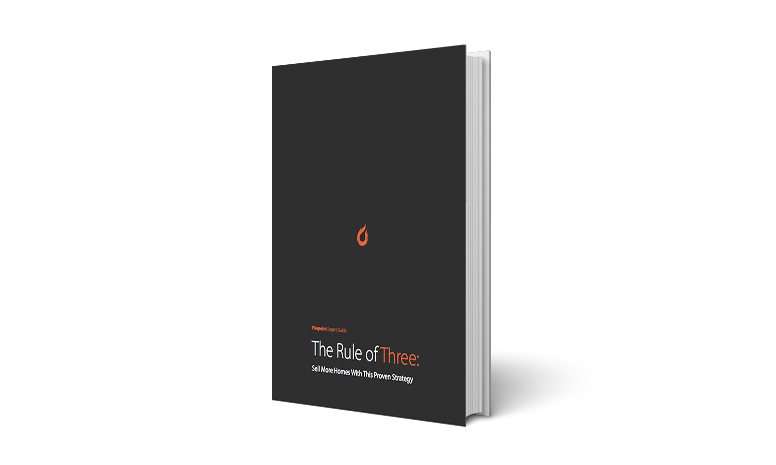 Download Your Free Guide to Sell More Homes with our "Rule of 3"